Mondesi's House: BOB HUGGINS AT ALBERT GALLATIN? BOB HUGGINS AT ALBERT GALLATIN? When Syracuse was unceremoniously tossed out of the ring in the NCAA's Battle Royale, West Virginia became the default torch bearer for the Big East Conference with their win over Washington on Thursday night. So some of us are begrudgingly going to become Mountaineer fans for the greater good of the conference. 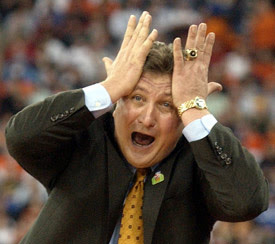 We all know that the always-cheerful Bob Huggins is the captain of Good Ship Mountaineer. But one tidbit about Huggy Bear was recently brought to my attention that I was previously unaware of: he was a student-teacher physical education instructor for one semester at Albert Gallatin HS in Fayette County in 1977. Although Huggins’ time at Albert Gallatin was brief, he left a lasting impression on Trincia. So there you go: Bob Huggins was a complete gentleman as a young man and has a connection to Fayette County. Toss in a public scolding of Mountaineer fans earlier this season and we might have something that many Pittsburghers could embrace (but only until the end of the tournament). F**K West Virginia. I'll never root for them no matter what. I don't care if they're in the Big East. I hope they lose every game. Loving the Panther fans angst. Here's hoping you a$$clowns take a collective jump off the Fort Pitt Bridge. GO MOUNTAINEERS!!! Gotta agree with Larry here...there is no "greater good" of the conference. Hell we don;t even know what this conference will look like in coming years.